New signing Dylan King says he is looking forward to the challenge at Coleraine. The 20-year-old put pen-to-paper on a two-and-a-half year deal with the Bannsiders on transfer deadline day after a brief spell with Glenavon. The former Motherwell knows there is plenty of defensive competition at The Showgrounds, but he feels that will bring the best out in everyone. 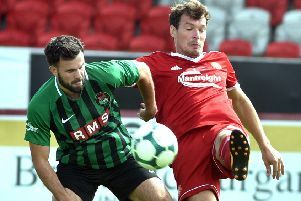 "You have to have competition in the changing room, there's no point people turning up knowing they're going to play," he said after coming on to make his debut against Dergview in the Irish Cup on Saturday. "I know from speaking to Rodney that's what he wants here at Coleraine, as it helps everybody."